Sometimes the best recipes are the simplest. 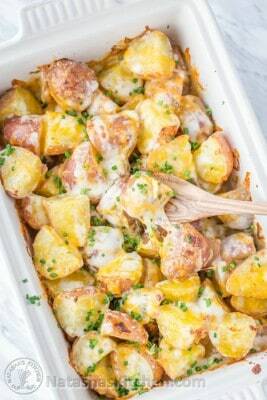 These baked ranch potatoes have just 4 ingredients and they're perfect for dinner; whether it's for the fam or a party! Cut potatoes into 1″ to 1 1/2″ pieces. Fill a 5 Qt pot half full with salted warm water (about 7 cups water and 1 tsp salt). Add potatoes and bring to a boil then cook at a low boil for 8-12 min depending on size of potatoes (they should be nearly done and should be fairly easy to pierce with a fork) Drain well. Drizzle 1/2 cup ranch dressing directly into the pot with drained potatoes and gently toss - just enough to coat evenly. Transfer potatoes into greased casserole dish. Sprinkle potatoes with garlic salt to taste. Bake uncovered at 400˚F for 20-25 minutes. Remove casserole from oven and set oven to broil. Sprinkle the top with 1 cup Mexican cheese blend, return to oven and broil for 2-3 min or until cheese is melted. It's perfectly ok to add more garlic salt at the end if you under-seasoned it the first time (speaking from experience).